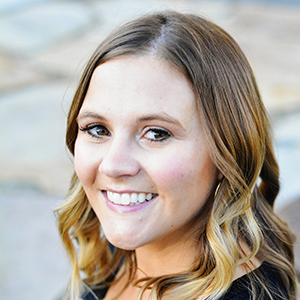 Arm Candy Purse Giveaway with TWO winners! I think I can safely assume that women, as a collective, LOVE purses! I bought my first purse when I was like 12, I think. It was blue canvas, more like a large wallet with a strap. But I thought it was friggin’ awesome. And what else is friggin’ awesome?? This PURSE shop called Arm Candy For You! “My name is Priti Shirname. I’m a proud Indian, engineer, MBA, military wife, and a mother of 2 brats who keep me on my toes alongwith a huge St. Bernard! My training in creating 3-D images helps me to translate pictures in my head into reality with the help of my Industrial & regular sewing machines. I am addicted to making bags & try to create world class products with ethnic Indian aura through my purses artistically crafted in silk, brocades, leather…basically anything I can get my hands on! And Priti is NOT kidding about churning out those bags relentlessly! She has dozens and dozens of designs!! Something for everyone! She actually has two shops, one exclusively for her fine leather purses (can you believe she MAKES those?!) and the other for the rest of her fun bags. 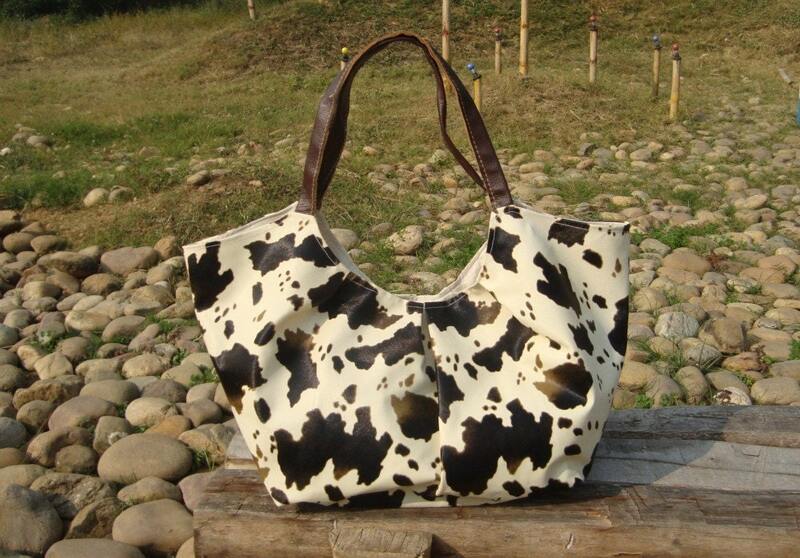 I love this Dalmation print bag! And I love how organized it stays on the inside! My bags are a MESS…I could really use this! Lovin’ the pleats on this fun wristlet!! 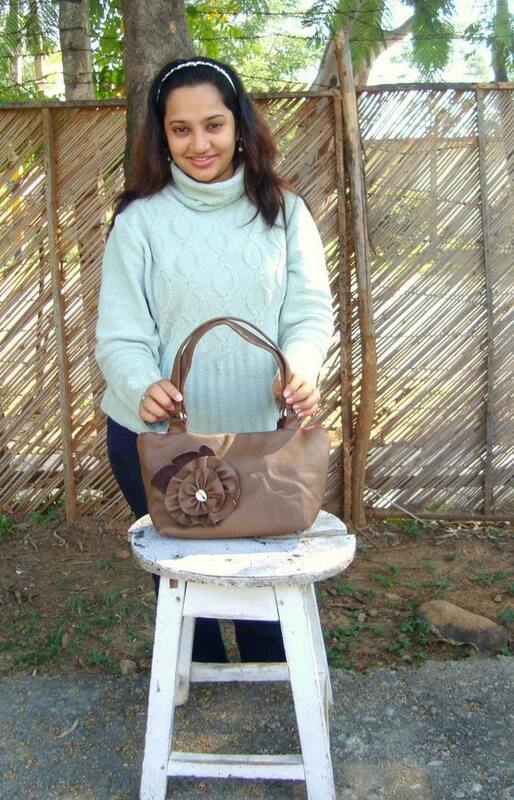 Here’s one of her lovely leather bags…that is an AMAZING color! Such a fun leather bag, love the flower! How fun is this damask! I love the convenience of this little wallet! I would stick this little guy in my ginormous purse and my keys would never be lost again!! This cute wristlet comes with this super cute necklace! So today TWO, that’s right, TWO of you can win a $20 credit to either of her purse shops! And comment back on your favorite purse! Enter HONEYBEARLANE at checkout (at either of her shops!) for 15% off! She has a lot of cute purses but my favorite would have to be the "Handmade Pleated Printed Clutch Purse Aquamarine Zip Top" one! These are lovely, and this giveaway is just in time as my purse was recently made unusable by the shenanigins of my munchkins. I like the chocolate should bag the best, but she has some great clutches that I am drooling over as well. Wow! Such incredible talent. 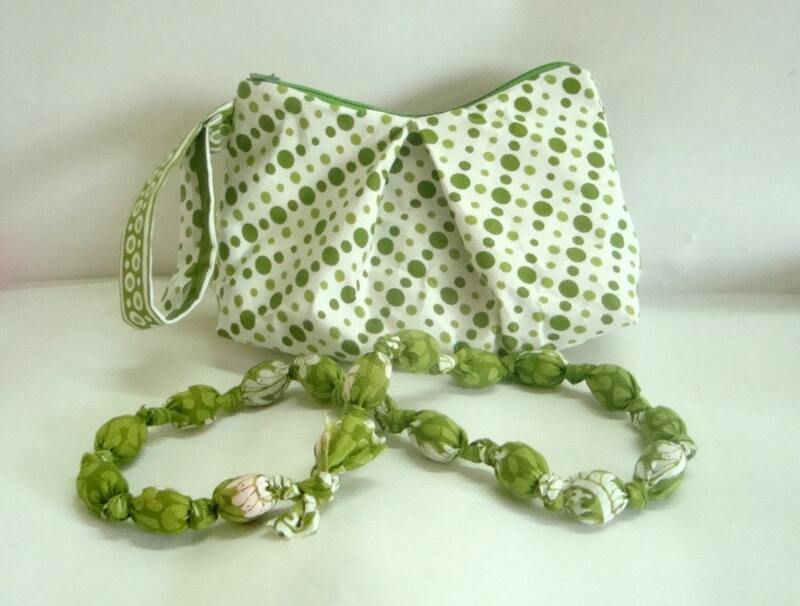 I love the green leather one, and the damask cloth tote. They're all so nice! I'd love to win this one! I am in LOVE with the Easter Basket Lunch Snack in blur and red! 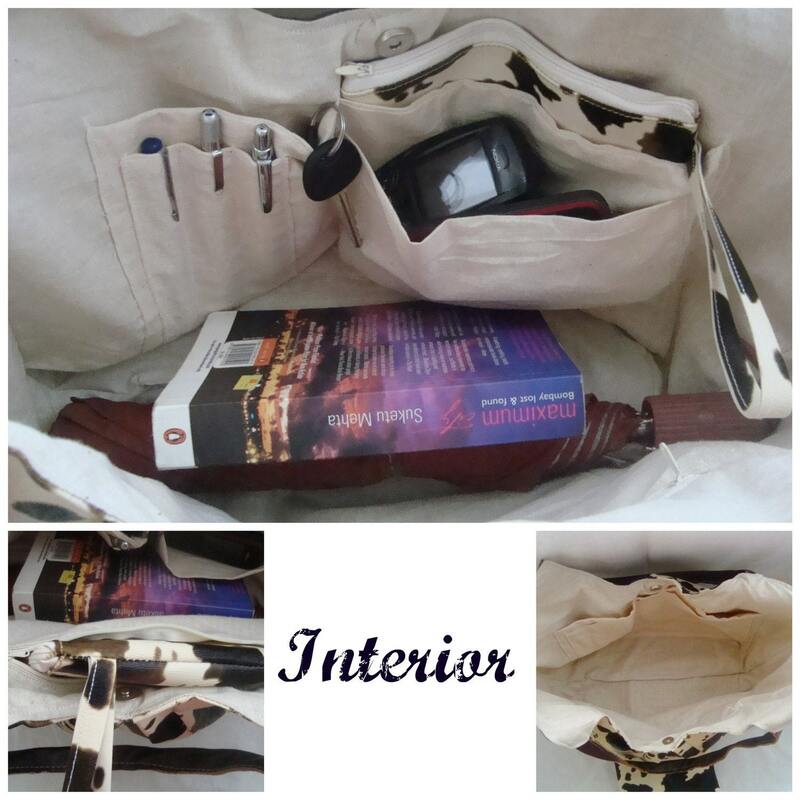 My most favorite was the Unisex Travel Bag Horse Leather Hand stitched Chestnut Red Adjustable Strap. Love the Messenger style Damask chocolate! So cute! I love the nautical bag–so adorable! what a fabulous shop! i like her on facebook! what a great giveaway! thanks! Love the Dalmation print purse! I love her red silk clutch purse that has a rose on it! I follow ArmCandy on FB! I think my fave is the brown and white damask bag pictured above, but I would be thrilled to have pretty much anything she makes. Thanks for the chance! I have followed her on FB and Etsy for awhile now..her bags are so lovely. I love the Kids Easter-Lunch totes- the denim ones are nice. I love the damask chocolate/white tote. So cute! Shoulder pleated Tote Leather Straps Zip top Teal yellow velvet is definitely my FAVORITE!!! I am now a follower of her blog. And I follow her blog now! I follow her on Facebook too! My favorite is the Pleated Brown Camo Jungle Print Clutch Purse. So cute! I love all the pleated wristlets! Lovin' "Messenger Black White Adjustable Strap button closure" since I'm a waitress and keeping all my stuff in one bag would be FABULOUS!! I'm following her blog now, too! "Liked" her on facebook too! Love her one of a kind Handmade Tote Canvas Orange Floral Vegan Stripes. LOVE the bridal clutch in Avocado green. Such a pretty color! I like the kids' Easter basket bag! I really like the Shoulder Bag linen Messenger style Damask chocolate Adjustable Removable Strap….it's gorgeous! I also am a new follower of her blog. Liked her on facebook as well. I like the messenger style brown damask. 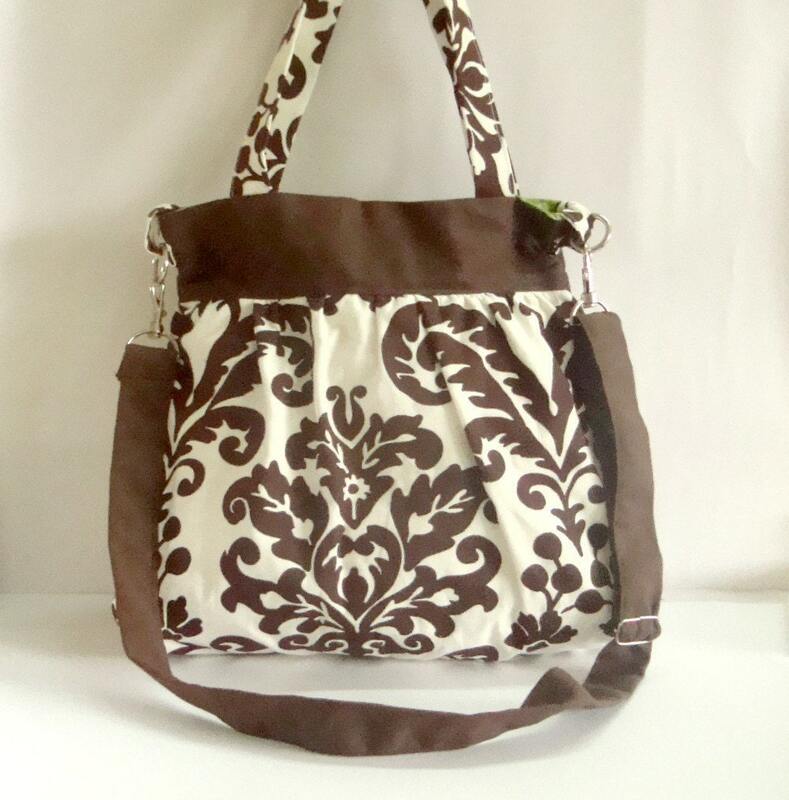 Messenger style Shoulder Bag linen Damask chocolate would be perfect! I also like the damask bag and some of the brightly colored clutches! i am in desperate need of a new purse! and i have my eye on that Messenger style Shoulder Bag linen Damask chocolate Adjustable Removable Strap! thanks! It is so unique and I love the styling. I hope I win!!! 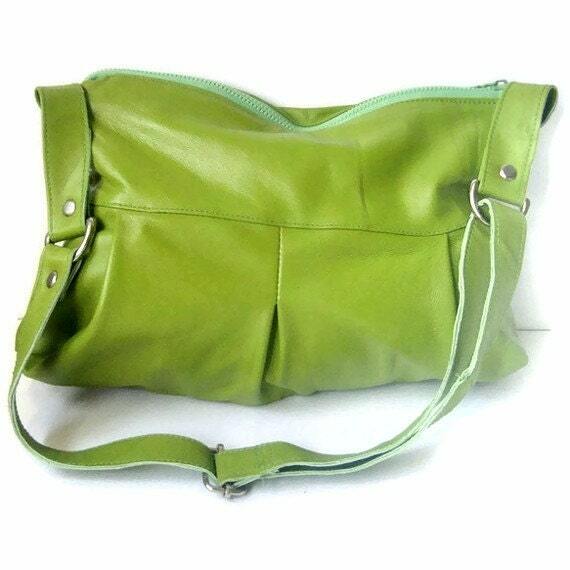 I'm in love with the color of the Leather Purse in Chartreuse Zippered Adjustable Cross Body Strap! 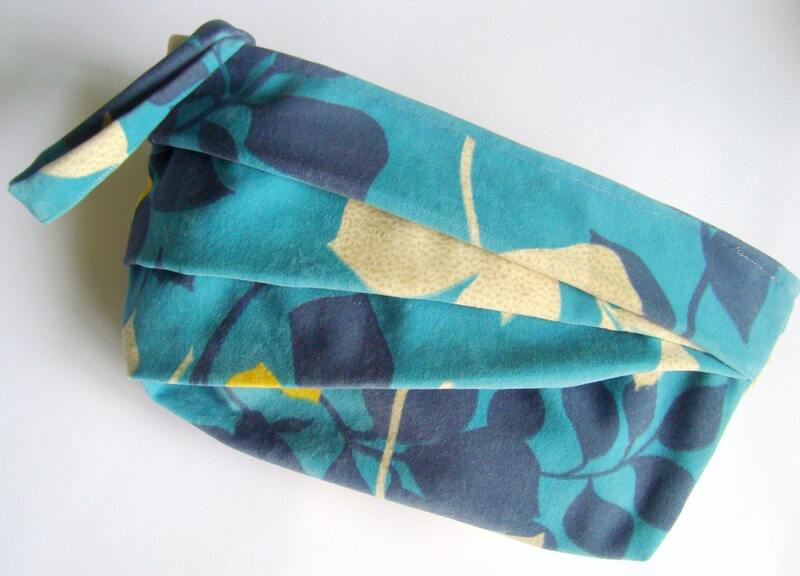 I would get the aquamarine trifold ruffled wallet and the yellow blue zippered cosmetic pouch! love the leather pleated clutch purse in cobalt blue…darling! I have to agree with one of your choices- the Brown Damask Shoulder Bag is gorgeous AND lots of pockets. Don't know where I would be without pockets! 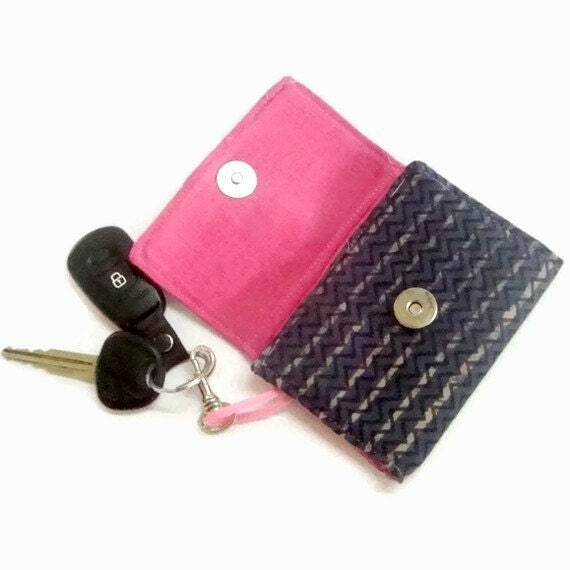 love the Handmade Clutch Purse Pleated Faux Leather Gray Vegan Wood handles.